Many households in the UK are at risk of flooding. By planning, preparing, and making your property more resistant and resilient, you can aim to reduce the impact of flooding to yourself and your property. From creating a flood plan to dealing with insurance, there are many resources available to help you plan and prepare for flooding to your home, and ease the recovery process that follows. Planning ahead for flooding will ensure that you can respond to the incident in the most efficient way. You can do this by creating a basic plan of action, checking your insurance covers flooding, signing up to receive flood alerts and warnings, and understanding your responsibilities. Download our ‘How to reduce the impact of flooding’ resource here for more information on how to become more prepared and more resilient to the potential impacts a flood can have. 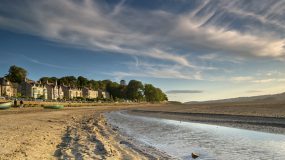 When buying a house, you should always consider the flood risk to the area and to the property. If you are unsure whether the property is located in a flood risk area, you can check the property’s long term risk of flooding using this map. It is always a good idea to create a household flood plan if you live in a flood risk area, even if you have never been flooded before. It ensures that when receiving a flood alert or warning you know what actions to take, you can deploy any temporary flood resistance measures efficiently, and you are best prepared to protect your property and belongings from the impacts of flooding. The information on this page explains how to create your household plan, click here to download the household flood planning guide which contains all of this information. You can download a printable version of a flood plan here. The document contains a pre-populated flood plan and a blank flood plan which you can complete yourself and keep in a suitable, easy-to-see place in case a friend, relative or neighbour may need to find it in your absence. As part of your flood plan it is a good idea to sign up for free flood alerts and warnings from the Environment Agency which can be received by call, text or email by more than one individual for the household. It is important to understand what the different warnings mean as you can use them as a trigger to put your plan into place at the right time. Aside from Environment Agency warnings, you can also use alternative flood warnings. Flooding to low lying land and roads is possible – Stay vigilant and make early preparations for a potential flood. Prepare to act on your flood plan. Monitor the situation and check the forecast and river levels. Ensure you have access to your flood plan, flood kit and property flood resilience products. Move or weigh down outside furniture and decorations if you know a storm or strong winds are expected. Flooding is expected – Immediate action is required to protect yourself and your property. Put your flood plan into action. Move valuable items and furniture upstairs or to safety. Deploy temporary flood resistance products – note where they are stored and how to install them. Prepare to evacuate if severe flooding occurs. Ensure the safety of your family members and pets. Severe flooding is expected – Significant risk to life and property. Prepare to evacuate and cooperate with emergency services. Evacuate. Upon receiving a severe flood warning you will need to evacuate your house and cooperate with advice from the emergency services. Turn off gas, electricity and water supplies if possible and safe to do so before you evacuate. 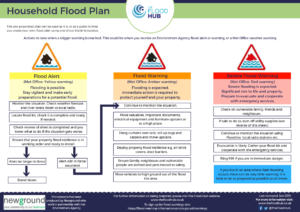 For more ideas on what you can add to your step-by-step plan of action, download our Household Flood Planning Guide here. A plan of what to do if you need to evacuate should be included in your flood plan. You should follow local news or contact your local council to find the nearest emergency assistance centre. You can prepare a flood kit containing essential items you would need if you have to leave your house. It is important that your flood plan is reviewed regularly to ensure that contact details are up to date. You should create a maintenance schedule to check that property flood resilience measures still function correctly, and practice installing them periodically. Keep important documents in waterproof storage or saved on a memory stick and stored upstairs. Call the Environment Agency’s Floodline (0345 988 1188) if you are unsure of the immediate risk to yourself or require flooding advice. The Environment Agency incident hotline (0800 80 70 60) should only be used to report a flood. Gas, electricity, water and telephone suppliers will help you to locate and turn off these supplies. Your local council can usually provide useful information about resources available in your area such as the location of the nearest emergency assistance centre. Local radio stations will be up to date with the latest news and weather conditions. Having contact details of relatives, friends and neighbours is important if you need to quickly warn anyone of potential risks and danger, or to let them know where you are. If flooding has occurred and you decide to make a claim, it is important to call your insurance company as they will provide you with important information regarding what to do to ensure your claim remains valid. Keep a note of your landlord’s contact details if you do not own the house. Visit this Blue Cross for pets page for more advice on how to protect your pets during flooding. It is good practice to fully test your flood plan once finished, and run a ‘flood drill’ so everyone in the house knows what to do and what to expect if you ever have to put your plan into place. Flooding to a household can cause serious damage if you don’t have any flood protection in place, or if the protection you have has failed or is overwhelmed. You should ensure that you have adequate cover for both your buildings and contents. If you live in a flood risk area you will want to be insured for flood risk, however insurance for households in flood risk areas has often been very expensive or even unaffordable. Planning and preparing for a potential flood can be seen as positive steps to access flood insurance. Carrying out actions to reduce the impacts of a flood event may make it easier for your property to be accepted by insurers. These actions may include carrying out a property level flood survey and installing property flood resilience (PFR) measures. The insurance company may recognise that you are taking steps to minimise the potential damage which could be caused by a flood. In 2016 the Flood Re scheme was developed from collaboration between the insurance industry and the Government, and enables householders in flood risk areas to purchase affordable flood insurance. The scheme is due to run until 2039. Please be aware that any households built after 2009 are not eligible for the Flood Re scheme, so make sure you are eligible first. 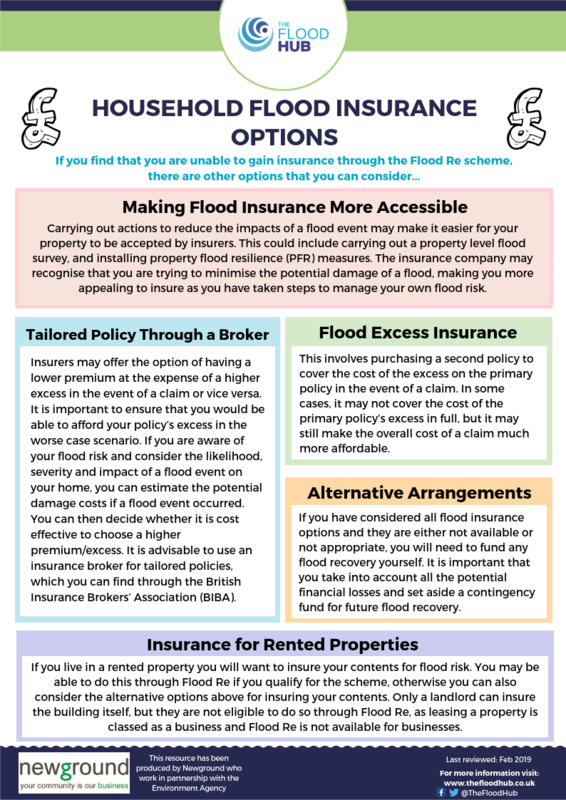 For more information on how Flood Re works and an overview of other household insurance options, download our resource here. Insurers may offer the option of having a lower premium at the expense of a higher excess in the event of a claim or vice versa. Therefore it is important to be aware of your flood risk and consider the likelihood, severity and impact of a flood event on your home, to estimate your potential damage costs if a flood event was to occur. Household flood planning can be very effective at reducing the cost of damage. It is important to always ensure that you would be able to afford your policy’s excess in the worse case flood scenario. It is advisable to use an insurance broker for tailored policies. 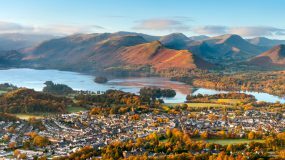 British Insurance Brokers’ Association (BIBA) has a ‘Find a Broker’ service that can help you find and contact a specialist broker to help you find flood insurance cover. This involves purchasing a second policy to cover the cost of the excess on the primary policy in the event of a claim. In some cases, it may not cover the cost of the primary policy’s excess in full, but it may still make the overall cost of a claim much more affordable. If you have considered all flood insurance options and they are either not available or not appropriate, you will need to fund any flood recovery yourself. It is important that you take into account all the potential financial losses and set aside a contingency fund for future flood recovery. Only a landlord can insure the building itself. If you live in rented accommodation you may be able to insure your contents for flood risk through Flood Re if you qualify for the scheme. The Flood Re website outlines the conditions under which they will cover a tenant’s contents in a rented or leasehold property, and states the types of properties that are not eligible. As a landlord you are not eligible to insure the building through Flood Re, as leasing a property is classed as a business. See our section on business flood insurance for more information on how to insure your building. For information on how to deal with flood insurance when flooding has occurred, see our ‘Handling your Insurance’ section here. Preparing for future flooding will enable you to be well equipped to deal with the impacts of a flood, and protect you from some of the disruption caused by floodwater. Having a flood kit and property flood resilience and resistance measures will help you to be more prepared. 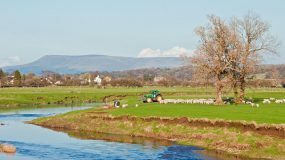 Download our ‘How to reduce the impacts of Flooding’ resource here for more information. Having a pre-prepared flood kit will make matters a lot easier in the event of a flood. It should be contained in a sturdy but easy to carry bag and stored in an easy to find place. Priority Service registers are used by United Utilities and Electricity North West and have been set up to help those across the North West who may need extra support during a power cut or when there is a disruption to water supplies, due to issues such as age, ill health, mental health problems, language barriers or financial worries. The Priority Services could help you or somebody you know benefit from extra support from the companies so they can respond to yours or their particular needs. 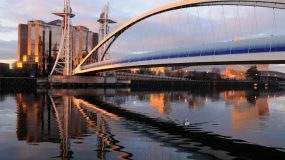 The service is free of charge for customers in the North West. Both companies have a free of charge password scheme as part of the Priority Services Register, this ensures that vulnerable people can trust that the people knocking at their door are genuine and who they say they are. It is essential that all contact details are kept up to date to benefit from the service. You can register for the United Utilities Priority Services online by clicking here. Or alternatively, you can call them any time on 0345 072 6093. You don’t have to be the named bill payer to benefit from Priority Services. For more information on United Utilities Priority service, click here. Registering for the Electricity North West Priority Services Register involves filling in a form online which can be done by clicking here. The benefits of signing up for the service can be viewed here. Preparation for flooding can include installing both flood resistant and flood resilient measures to your home in order to reduce the impact of the flood event. There are many different products available to help protect your household. For an overview of the differences between flood resistance and flood resilience, download this Flood Resistance vs. Flood Resilience resource. This Flood resilience & Flood Resistance booklet provides more details about the different products available and what they can do for your household. It is important to ensure the resistance and resilience measures installed at your property are regularly maintained and in good working order so that they work correctly and offer the protection for which they are designed. Download our property level flood resilience health check resource here. You may be aware of ongoing flood schemes in your area which are designed to reduce the risk of flooding to your house and surrounding properties. 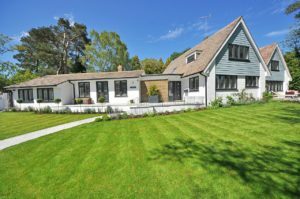 Even though the risk to your property may be lessened, you shouldn’t rely on these schemes for full protection, and there will still be a level of residual risk present. Therefore implementing resistance and resilience methods throughout your household yourself, will ensure it has a higher level of protection. Sustainable drainage systems, often referred to as SuDS, are a natural approach to managing drainage for single or multiple properties. They may be implemented at a property’s construction design stage, or retrofitted into an existing property to reduce the contribution it makes to flooding by slowing and storing surface water runoff and rainfall in urban areas. SuDS help to stop drains becoming inundated in times of heavy rainfall and slowly release water back into the watercourse. 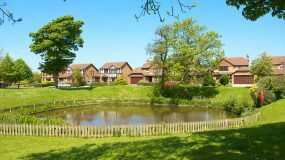 Find out more about SuDS in our Planning and Development section. Having a property flood resilience survey carried out can help to identify the most suitable resistance and resilience measures to help protect your home against flooding. The surveys should be carried out by experienced property flood resilience professionals and should consider flood risk, water entry points and thresholds, and the suitability of any resistance or resilience measures for both the property and its residents, with consideration to cost restrictions. 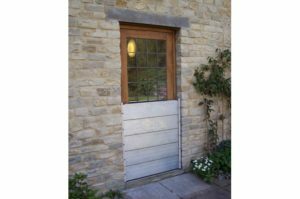 There are a range of property flood resilience and resistance products available, from affordable to much more bespoke and costly alternatives. Know Your Flood Risk’s ‘Homeowners Guide to Flood Resilience’ document has details of various products that are available to be purchased. The Buy with Confidence scheme highlights trustworthy businesses to source products from. The Blue Pages is a directory of flood products which gives information on available options of protection, and this Trader Directory can be used to find traders in your local region. 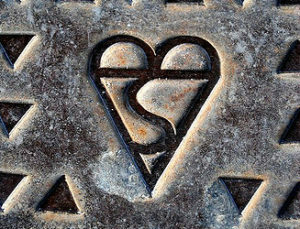 You can ensure the quality of any products you purchase by checking that they are Kitemark certified meaning they have been thoroughly tested in a BSI (British Standards Institution) approved testing facility and therefore have good safety, quality and reliability. The BSI Kitemark for Flood Protection products is known as PAS1188. See here for more guidance on checking the certification of products. 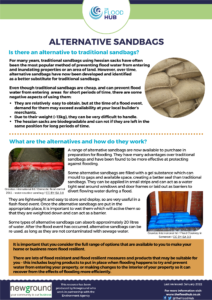 Although hessian sandbags have traditionally been a popular flood protection measure they are not the best option for quick and easy flood protection and there are now alternative sandbag options readily available which are much more effective and create a better seal. Local Authorities have no statutory obligation to provide sandbags, although some may provide a limited number during a flood event. Therefore it is best to make your own provisions to protect your house and check your Local Authority’s policy in advance. Store important documents and valuables such as photo albums upstairs or on raised shelves. Furnish your property with items made of flood resilient materials such as metal, plastics or hard wood. 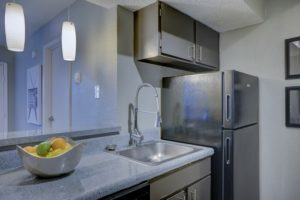 Appliances such as fridges can be raised on plinths. Consider temporary resilience measures such as airbrick patches, alternative sandbags and expandable flood barriers. 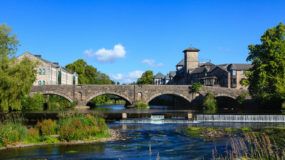 Extra consideration is required for flood resistance and resilience of traditional buildings, listed buildings, or those in a conservation area. Check whether you need to get permission before making changes by contacting the planning department of your local council. Keep it breathable and use the correct materials. Get a property flood resilience survey. 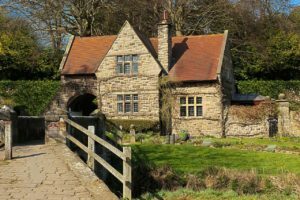 For more information regarding traditional and protected buildings, have a look at our booklet here. Once you believe you have made your property more flood resilient, check that you have covered everything on our property flood resilience checklist here, to ensure you are as prepared as possible for a future flood event. Reporting flooding is critical in ensuring that risk management authorities (RMAs) are aware of problems and can deal with incidents effectively. It is important that you know who to report the different types of flooding to, and continue to report each incident to allow RMAs to collate data to keep track of the overall picture of flooding in that area. If you have experienced flooding, it is very important to report it directly to the relevant authority as early as possible. We do not process any flood reporting on this website, please see below for who to contact. Contact your Highways Authority (County Council or Unitary Authority), they will clear blocked public drains. Click here to find the website for your local council. Flooding to ordinary watercourses such as streams or culverts should be reported to your Lead Local Flood Authority, which will either be your District Council (providing it is a Unitary Authority) or County Council. Click here to find the website for your local council. Report groundwater flooding to your Lead Local Flood Authority, which will either be your District Council (providing it is a Unitary Authority) or County Council. Click here to find the website for your local council. Contact United Utilities on 03456 723 723 or visit their website here to report overflowing sewers that are affecting your home or garden. Contact your local water company, which is United Utilities if you live in the North West. For blocked drains visit their website here, or for burst water mains, visit their website here. Alternatively you can call 03456 723 723. Flooding from the sea or a main river. A blockage, for example caused by a fallen tree. Collapsed or badly damaged river or canal banks. Unusual changes in river flow. Contact your Unitary Authority or County Council to report flooding from other watercourses. Click here to find the website for your local council. Floods caused by private drains are the responsibility of the homeowner. Click here to download the ‘Who’s responsible for Flooding?’ resource. 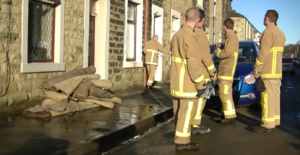 Household flooding events can cause major damage both physically and emotionally and it may take months to fully recover from all of the disruption caused. The following information gives some advice on how to ease the recovery process and how to help your household to recover as quickly as possible. Click here to download a ‘Flood Recovery – The First Steps’ booklet. There are a few key contacts you may wish to have to hand when starting to recover your household after a flood. When re-entering a flooded house there are some potential dangers to prepare for and look out for so you can stay as safe as possible. You should firstly ensure that you and your family are safe from any risks posed by the flood before starting this part of the recovery. If you have evacuated, wait for the flooding to subside before re-entering your property, and try to return in the day time. Take with you – powerful battery operated torch, permanent marker, notebook and pen, large scissors capable of cutting through carpet, large plastic bin bags and a camera/camera phone. Do not take children or pets with you. Never touch electricity sources when standing in floodwater, especially if you were not able to turn the power off before the flooding occurred. Turn off the gas supply even if appliances seem unaffected. If you suspect a gas leak call the National Gas Emergency Service on 0800 111 999 and do not enter. Find out the safety of your water supply. For a mains supply ask your water company, for a private supply ask the environmental health department of your local council. Any septic tanks or non-mains drainage systems will need to be checked by a qualified engineer to ensure they have not been damaged. Be aware of rogue traders who may try to take advantage of you. Get a written quote on letter-headed paper with a landline number and address before entering into any agreement. Check they are registered with the Government’s Buy With Confidence scheme. When flooding has affected your household and you have decided to claim on your flood insurance, one of the first things you should do is contact your insurance company. They will take you through all of the relevant steps to ensure your claim remains valid, but the overall process can sometimes be stressful and lengthy. Most insurance companies have a 24 hour helpline, so contact them as soon as possible. Do not move anything or throw anything away until you have had confirmation from your insurance company as this may affect your claim. Take photos of all the areas that the floodwater has affected and the damage that it has done, with a time stamp if possible, the more photos the better. If possible also take photos before flooding has occurred. Keep a record of any correspondence with your insurance company, loss adjuster and other experts. Record the name of the company, the date of each conversation, the advice they give, and what is agreed. Keep copies of emails and letters sent regarding your claim. Be aware that the services offered may take several days to take place if a lot of people have been affected in the same area. Arrange for a loss adjuster to contact you to plan a visit. A loss adjuster will work out the repairs and replacements needed and how much is covered by your policy. Cover costs for alternative, temporary accommodation. The amount of cover you get will depend on the level of cover you take out and will not cover you indefinitely. Buildings insurance should cover the costs for drying out, restoring the property itself and fixtures and fittings, removing debris and professional fees. Contents insurance should cover the cost for repairing or replacing damaged furnishings, equipments and other belongings. Contractors working on your property should provide a dry test to ensure suitable conditions after the clean up. Will they find temporary accommodation for you if you need to leave your property, or will you need to find it yourself? Will they be sending in other experts to deal with the clean up and reinstatement or do you need to arrange this and find quotes yourself? Will the costs of this work be covered by them? Is there an option of including resilient repairs to better protect the property? These are difficult to implement retrospectively, so it is helpful to establish this early on. If they provide contractors, get confirmation that they are suitably qualified to recover your building, especially if your home is listed or another type of historic structure. Valid confirmation would include a portfolio of previous work and relevant qualification certificates and badges. If you are not covered for flood risk, you will be responsible for recovering your property from flood damage and covering the costs yourself. Be aware of where you can get supplies such as pumps, generators, driers and disinfectant. Once flooding has settled, remove any standing water and start the drying out process as soon as possible – the longer it stands, the longer it will take to dry out. If you need temporary accommodation, start looking quickly if a large number of properties have been affected. 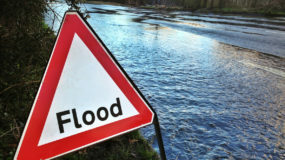 When flooding has occurred, you may be able to find assistance from local councils and Authorities, and from charities or community groups who might also offer goods or grants. 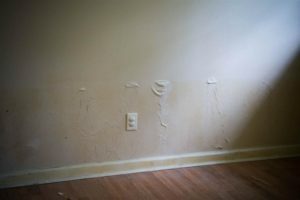 There are many things you can consider when cleaning a flooded household in order to avoid potential dangers and ensure valid insurance claims. Mark a line on the wall to show how high the water reached in every room. This helps your insurance claim and helps builders know how much stripping out needs to be done. Shovel away any mud or silt and then take up floor coverings to allow floor boards to dry out. Keep a section of carpet and underlay to show your insurer. Only throw away belongings that cannot be cleaned from flood or sewage water. The rest you should clean well with disinfectant or in a dishwasher. Hard surfaces such as hard wood, plastics and metals can be washed with hot soapy water and disinfected. Ensure good ventilation by opening windows and doors. Use fans, industrial heaters and dehumidifiers – provided by your insurance company. Put your central heating on at 20°C or above. Your insurance should cover a contractor to test that your property is dried out suitably. If you leave your home for it to be restored, take note of the meter reading as the electric used in the repair period will go towards the cost of repairing your home. Your insurance company should provide skips. If uninsured, skips may be provided by your local council. Remove sewage water from your home and garden. Clean and disinfect areas affected by sewage; however this is not a deep clean. For more information on how United Utilities can help you, visit their website here. Experiencing flooding can be very upsetting and stressful, and it is important to acknowledge the effects of flooding on a person’s mental health and wellbeing. According to Public Health England, people who have been flooded are approximately 6-7 times more likely to have depression, anxiety or Post Traumatic Stress Disorder (PTSD) a year on than those not affected. Each person affected by flooding has been through different circumstances and can respond differently. If you believe that someone you know could do with a helping hand, ask if they are okay. If you feel that you need some help yourself, you can contact your GP or your Local Authority who can highlight resources available to you in your area. Alternatively, you can go straight to Mind, Red Cross or another similar organisation who will be equipped to help people in this situation. For extra downloadable resources, visit our Knowledge Hub ‘Household’ section here.